Students from Bedstone have celebrated securing a win at the regional championships of the UKMT Senior Maths Challenge. The Bedstone team beat strong competition from a number of top-performing schools across the region at Malvern College on Tuesday 13 November. 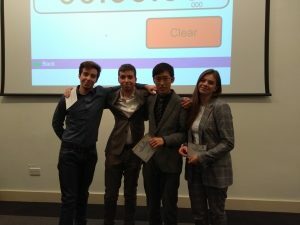 The United Kingdom Mathematics Trust runs an annual national competition which sees the top A-level mathematicians from schools across the country pit their wits against each other in a series of fiendishly difficult Mathematical Challenges. The high calibre of the schools taking part was commented on with 14 schools from the region participating in the challenge. All students should be justly proud and Bedstone’s winning team will now go to the finals in London on 5th February next year. The Bedstone College team consisted of Andrii P, Kostia P, Jason G and Hanna S all of whom worked tirelessly to prepare for this challenge. Headmaster, David Gajadharsingh said; “This is the second year running that our Mathematics team have won the Regional Championships. I am incredibly proud of what the team this year has achieved. Last year I mentioned that some were asking who exactly are Bedstone? Well, with this result, I think we have firmly positioned ourselves as the number one senior Mathematics school in our region. There can be little doubt in anybody’s mind that if you have a particular gift with Mathematics, the teaching at Bedstone can push you to achieve great things. “Last year, the two upper sixth form members of the team went on to study Physics at University College, Oxford and Mathematics at The University of York. This year both upper sixth form members of the team have applied to study at the University of Cambridge; both already having secured interviews, one at Girton College and the other at Sidney Sussex College. We wish them both the very best of luck with their applications.